this would be hilarious if it wasnt so serious. 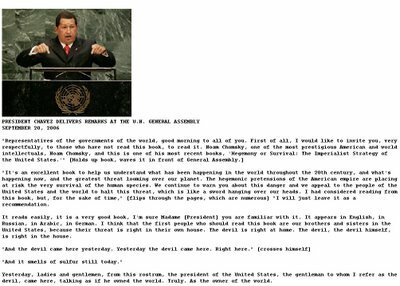 venezuelan president hugo chavez addressed the united nations today and told them that "the devil" meaning george w. bush had preceded him. when was the last time one countrys leader called another countrys leader "the devil" out in public like that? how low american respect and prestige has fallen across the world. we americans have the mindset that since we are over here on our own continent we are insulated in what goes on in europe or the middle east or anywhere else in the world. 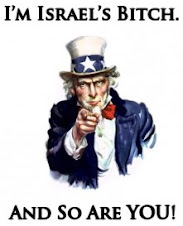 we think that we can do whatever we want because hey we are america after all. the fact is, is that george w. bush and those that support him and this includes you if you still do support him are united spiritually with and serve the devil - lucifer. what true christlike attributes can one see in george w. bush's leadership or lifestyle? george w. bush and those around him are proven liars and the bible says that the devil is the father of lies. connect the dots. oh but we are america god is on our side you say. who told you that lie? con artists, hucksters, walking dung bags like john hagee, pat robertson, jerry falwell, billy and franklin graham? god doesnt take sides he says do this and you will be ok. look around you what country is more spiritually wicked than the united states? real preachers would be telling us to repent and rebuke sin. all those clowns we just named are doing is deceiving us right along to our doom. pick up a bible ~ king james version~ and read what god says for yourself. open your eyes and stop supporting wickedness. in heaven and in hell there wont be a united states or any other country. Venezuela's Chavez calls US President Bush "the devil"
New York- Venezuela's President Hugo Chavez compared US President George W Bush to "the devil," who he said addressed the UN General Assembly "as if he owns the world." Chavez minced no words by satirizing Bush, who preceded him to the UN podium on Tuesday. 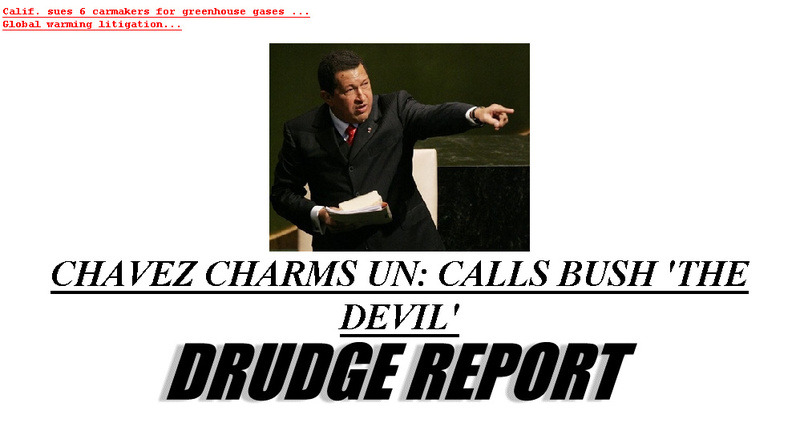 "The devil was right here, yesterday," Chavez said. "The devil came here and this place still smells today." "The devil is speaking as if he owns the world, we should call a psychiatrist to analyze it," he said. Chavez began his address to the 192-nation assembly by holding up a book written by Harvard professor Noam Chomsky, titled "Hegemony and Survival." "This book says about the imperialist strategy of the US, which is "the greatest threat looming over our planet," Chavez said.